Techniques in the neurosciences are evolving rapidly. There are currently very few volumes dedicated to the methodology - ployed by neuroscrentists, and those that are available often seem either out of date or limited in scope. This series is about the methods most widely used by modern-day neuroscientrsts and is written by their colleagues who are practicing experts. Volume 1 will be useful to all neuroscientists since it concerns those procedures used routinely across the wrdest range of s- disciplines. Collecting these general techniques together in a single volume strikes us not only as a service, but will no doubt prove of exceptional utilitarian value as well. Volumes 2 and 3 describe all current procedures for the analyses of amines and their metabolites and of amino acids, respectively. These collections will clearly be of value to all neuroscientists working in or contemplating research in these fields. Similar reasons exist for Volume 4 on receptor binding techniques since experimental details are provided for all types of ligand-receptor binding, including chapters on general principles, drug discovery and development, and a most useful-appendix on computer programs for Scatchard, nonlinear, and competitive d- placement analyses. Volume 5 provides procedures for the asse- ment of enzymes involved in biogenic amme synthesis and catabolrsm. 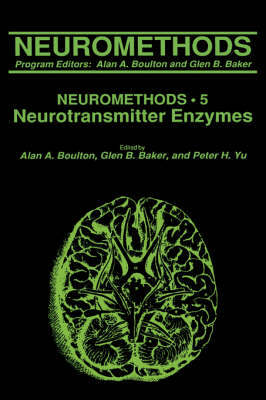 Volumes in the NEUROMETHODS series will be useful to neurochemists, -pharmacologists, -physiologists, -anatomists, psychopharmacologists, psychiatrists, neurologists, and chemists (organic, analyncal, pharmaceutical, medicinal); in fact, everyone involved in the neurosciences, both basic and clinical.